As a property owner, a management company, a homeowner or a condo association, you have the right to manage the parking on your property. If you are currently having issues with abandonment of vehicles, abuse of the designated parking areas or an infringement of your established guidelines for parking within your property, you may have them removed at the owners expense. Tolland Automotive provides relocation towing, parking enforcement towing, and parking lot patrol towing services for private property owners, management companies, condo associations, apartment buildings, businesses, parking lots, and more. We work with you to create the type of relocation agreement that works best for you. Options include call in only, patrol, or combination call in and patrol. 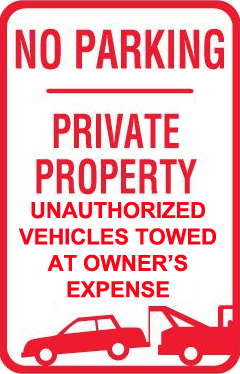 We can also help you facilitate a Tow Away Zone, providing proper signage to meet legal requirements. Whether you are a business owner, landlord, property manager, association president, management company, or private property owner, if you have a parking problem Tolland Automotive can help. CONTACT US today for more information. Tolland Automotive provides parking lot patrol and relocation services in Hartford, East Hartford, Manchester, South Windsor, and more.